GoodWe (Jiangsu) Power Supply Technology Co. Ltd, is renewable energy enterprise focused on the technical development and manufacture of solar PV inverters and related monitoring solutions. The industrial designs of the GoodWe ES and EM series bi-directional hybrid inverters derive from technology demanded by German standards and are best suited to on-grid application. 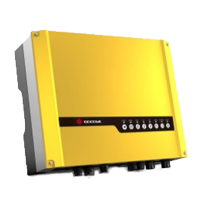 The Goodwe hybrid inverter include both Single and twin MPPT trackers to maximise the energy yield from either one or two independent strings of PV panels, a battery charger for lead-acid or Li-Ion batteries and a pure sine wave inverter for generating mains voltage. During the daytime, the PV plant generates electricity which can be provided to the connected loads and any surplus energy is used to recharge the connected battery pack for later use. The Goodwe hybrid inverter has two AC outputs, one connected to the main loads or non-essential loads and a second connected to essential loads which remains live in the event of a grid-failure which is powered from the connected battery pack. There are many aspects to selecting a system and we recommend you read our guides to System Types and Storage Batteries to better understand this technology. Segen holds stock of the GoodWe 3.0KW, 3.6kW and 5KW inverter in the EM range and the 4.6KW in the ES range. If you want to know more about GoodWe, you can find out more here on the manufacturers website. or refer to the documents tab on the specific product page on the SegenSolar portal.